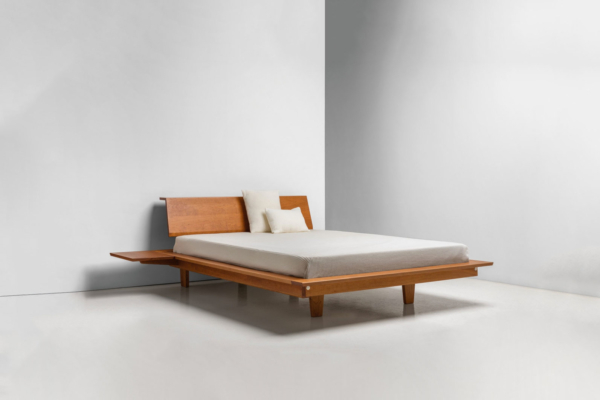 The Edo Platform Bed is minimalist to its core, stripping away pretense with its series of broad, surrounding surfaces, and a headboard that doubles as both a seatback for upright reading, and a stay for pillows while you sleep. Made with matched-grain hardwood planks, the bed’s unique platform frame gives the impression of floating, supported by four substantial legs that are recessed well inside the bed rails. Incorporating only what’s truly useful – including integral side tables for lights, reading material and sundries – its unique stance and innovative use of joinery distinguish it as uniquely Moser. When it comes to design, the pursuit of minimalism grows more challenging as the inessential is stripped away. Resting atop four sure feet, the Edo Platform Bed’s frame seems almost suspended in mid-air. Supporting curtain rails provide additional support to the upper portion of the bed, secured by precision tongue-in-groove joints at each corner. Through bolts with nickel caps strongly secure the base of the platform. Above the base, the bed shows its capacity for beauty and utility. Surrounded by a wide ledge, the platform is designed to accept integral side tables perfectly positioned to hold books, periodicals, and other bedside essentials. The headboard of the Edo Platform Bed carries its simple story a step further, suspended atop three posts and a slightly angled back to support an upright reader. The headboard finishes with an integrated crest that extends in a crisp curve, providing yet more storage space, while mimicking the horizontal lines of the bed’s perimeter platform. Our platform beds are designed to accommodate a 10″ mattress, for additional mattress height options, please select the “Customize This Piece” option.